Administrators have the ability to log in (proxy in) as any user in the system without knowing the user's credentials. This allows administrators the ability to submit forms and evaluations for the user they are logged in as. This also proves helpful when attempting to help other users troubleshoot the system. Click on the user's email address to log in as that user. You will receive a pop-up message informing you that you are about to be logged in as the user. Click OK.
You are now logged in as the other User and should automatically land on their Dashboard. Select the Contact Info tab at the top of any Request Summary or Form. You are now logged in as the other User, but still on the Request Summary or Form page. 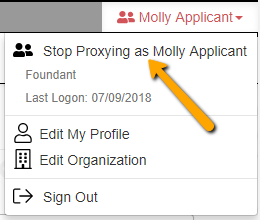 No matter how you proxied in you may return to your administrator account by clicking on the proxied user’s name in the upper right corner of the screen, and selecting Stop Proxying as. Note that any changes made while proxied in as an applicant will be logged under your name and not the applicants. If you do not want administrators to have the ability to proxy in as other users in your site, please contact Support@Foundant.com to have the feature turned off.